The dual lanes automatic packing machine KB37x2 produced by our company, is an innovative design and high speed machine. This machine has a number of patented technologies with advantages of perfecct performance, easy operation, reliable packaging quality, and stable operation. The speed of packaging is 2 times faster than that of existing packaging machines, which is the replaced products of already existed automatic pillow pack packaging machine, so it is a best option for most of clients. Application: A wide range wrapping applications, such as: Biscuits, Cupped Instant Noodles, Tissue and Wet wipes, Healthcare products, Hard ware ---etc. Features: 1. 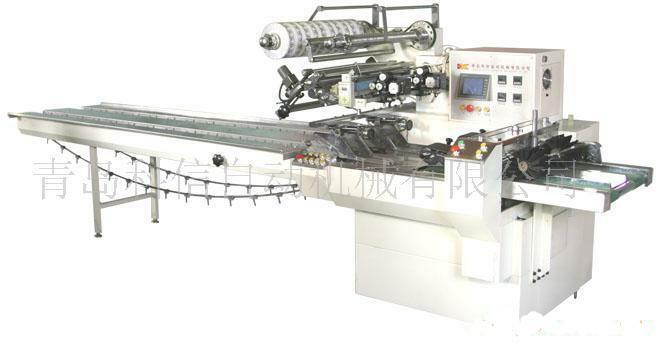 One Roll film, two automatic bag forming, filling, and sealing, as well as cutting with fast speed. 2.